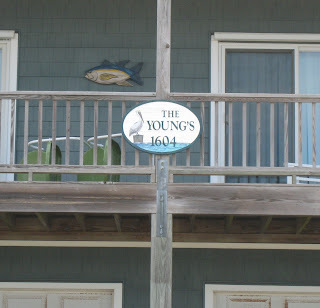 As at most beaches, almost every house on Topsail Island has it's own name. Most of these are quaint references to the sea, tide, wind, tranquility, etc., and pleasant in their own way. But some stand out for one reason or another, and here are a few that caught my attention. I'm not sure why there is an apostrophe on this sign, or at least why there is one placed where it is. Is the owner singular, and does he/she refer to him/herself in an objective way with a definite article? 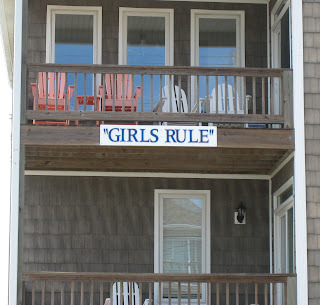 I guess the owner of this condo was going for a defiant feminist feel. But shouldn't it be something like "grrrls" or "grrrlz"? And why are there quotes around the name? No other home that I've seen here places their name in quotes on its sign, and I'm wondering why this one does. Is it actually an anti-feminist statement cleverly utilizing the ironizing quotes? 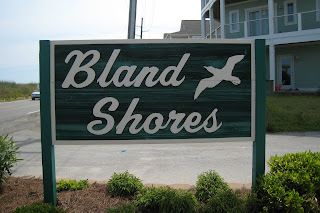 The Bland family has a long history on Topsail Island, and there are several things or places around here named after them. But there's just something about this sign that strikes me as wrong. Don't you want to go to a beach that has a little excitement to it, or at least one that is memorable?